In this episode, I explain why niche works in building an online business. Do remember life without the hashtag? Well maybe not, because the dear old hashtag turned 10 this week. Born on Twitter the now, powerful symbol, has transformed communications as we know it. Media outlets, social influencers and commentators and even TV shows covered the story and marketers joined in. On August 23rd 2007, Chris Messina sent a Tweet asking his followers what they thought about adding the pound sign in front of barcamp – a topical technology event. A decade later an average of 125 million hashtags are shared every day around the world on Twitter. As you know hashtags allow us to filter conversations that are meaningful to us – from sporting events to breaking news, business conferences, political discussions and so much more. The hashtag helps to silence the noise of the social web that we have no interest in. Praise Mr. Messina and praise the hashtag. Don’t forget to use #jsbtalksdigital if you are engaging with me on Twitter or search for it to join in my digital conversations. I use AgoraPulse as my social media management tool of choice. Big news this week with the reveal of their platform’s new layout and functionality. Writing on his blog, CEO Emeric Ernoult, said the revamp was long-awaited and overdue and he thanked his customers for their patience and support. The current version of Agorapulse was released in November 2013. He even admitted to answering customer queries form at midnight from his home in France. New filters for more granularity: The filters in the inbox now offer a lot more options: see all the messages reviewed by a specific team member or those assigned to a specific team member. It’s another way to check on your team’s work with ease. Saved replies: You can now create “saved replies” or canned responses for each of your social profiles and save a TON of time when using the same responses over and over again. This a long-awaited feature that we’re thrilled to finally deliver. Better emojis: Many of you have complained about the behavior of our emoji picker. It’s been improved big time. Not only the emojis are bigger now, but you can also search for the ones you need! Translation feature: Don’t you love when fans and followers engage with you? But when they speak a language you don’t, things get a little tricky. With our new “translate” feature, you can see their message in your own language in one click. Pretty convenient! And there’s lots more. Read more about the full AgoraPulse update on their blog post! Facebook and Instagram crashed this week with peeps in Europe, the US, Brazil, Japan and Australia weeping into their smartphones and desktops. Now as I was enjoying a family trip to Venice I had no such stress. However, Down Detector, a website that tracks internet outages, reported a large spike in users being unable to access Facebook at about 2.15pm on 26th August with some users of Instagram experiencing similar difficulties. It seems the technical problems appeared to be resolved for many users shortly before 3.30pm. According to media reports, at its peak, the social network was receiving 1,869 reports of outages. Did you suffer Facebook or Instagram downtime – did you weep, worry or feel weird? I’d love to know more – send me your story on Instagram to @jsbgrams. In today’s show I’m delighted to be joined from Kerry by radio presenter, podcaster and online entrepreneur Marian O’Flaherty. Marian O’Flaherty is a journalist, radio presenter, social media entrepreneur and podcaster from Dingle, Co. Kerry. After graduating from the University of Limerick with an LLB in Law & European Studies she wrote for The Kerryman newspaper while also freelancing in photography for a number of national titles. She founded dinglenews.com in 2008, a niche online news source dedicated to the Dingle Peninsula which cultivated a strong online following. It was shortlisted in the top ten blogs category at the Irish Blog Awards in 2011. In 2015 she joined Radio Kerry firstly as the presenter of the Irish language programme Caint Chiarraí going on to work full time in the newsroom as a journalist and newsreader in 2016. In 2017 she won the national award for Local Radio at the Law Society or Ireland’s Justice Media Awards. Tune in to listen to my interview with Marian. In this weeks’ show I’m sharing three online niche case studies which are worth studying. UK-based Roy Lilley is a health commentator that has amassed a massive online following and influence. He runs the hashtag #healthchats and in fact takes those chats offline and on the road. I attended one recently in Dublin, his very first live Irish #healthchat and he will soon be a guest of this podcast. He has been voted the top UK speaker on NHS topics twice and is listed in the Debretts most influential people in healthcare. Roy is the Founder of the Academy of Fabulous NHS Stuff a repository which has become a social movement and is seen as the change platform for the NHS and Social Care. One of my favourite law enforcement and social media influencers, US-based Lauri Stevens is the original #LESM commentator. Lauri wrote the foreword for my book – Social Media Under Investigation, Law Enforcement and the Social Web – and also is the organiser of the SMILE conference at which I spoke in 2015 in Phoenix, Arizona. Her consulting company LAwS Communications has been providing communications consultation to law enforcement since 2005. LAwSComm provides excellent service and support exclusively to the law enforcement profession through training, strategy consultation and the SMILE Conference. LAwSComm produces the internationally known and distinguished ConnectedCOPS blog and the notably prominent ConnectedCOPS Awards. Irish-based Samanta Kelly is the founder of the Womens Inspire Network which is a community of 7,000 women in business from across the globe. Samantha Kelly and Helena Gilhooly run the Women’s Inspire Network which started out on Twitter as a hashtag #Womensinspire which then moved to a very popular Facebook group. The community has grown into a membership site, live events as well as a series of Facebook Lives. Samantha has also been revealed as one of the speakers at next year’s Social Media Marketing World in San Diego organized by Social Media Examiner. In this episode, Marian (this weeks interview guest) has a question for me about promoting your podcast. Tune in to listen to my answer. In today’s column, I’m sharing with you my digital transformation into the public sector. I’ve been in business for nine years and I have to say it was this year where I finally got crystal clear on my business. Heretofore, I was working with all sorts of clients on all sorts of projects and with all sorts of budgets. Don’t get me wrong, there is nothing wrong with that, but I felt like I was always jumping from Billy to Jack (this is a good old Irish phrase). 2017 is the year I got focus. This is the year I had my own digital transformation with my segue into the public sector. As many of you will know, I am currently developing my suite of online knowledge products, a membership site and I’m writing my second book. All of this is happening with one niche in mind – marketing and communications professionals in the public sector. Trust me, I’ve very often fallen into the trap of being so broad for fear that I won’t get enough traction. However, as I know only too well, this is a bad strategy. Being niche online will help you carve out a space for you, help your customers find you more easily and help position yourself as an expert. So, this year my book, my signature talk, my 8-courses and my membership site will be dedicated to digital transformation in the public sector. And it’s quite an exciting prospect if I’m honest. Being niche is important but here’s what you need to do to make it work for you. Understand your audience and their needs. Focus on them while building your brand as they are the voice of reason before you create something that falls. Engage with your audience. Nobody wants to be spoken to – they want a conversation with you. So, once you find your audience spark up a conversation and keep it going. You know that social and email marketing as well as great content marketing will help you here. There has never been an easier time to engage with your customers – live and in real time! Leverage social media metrics and tools. There is so much data out there to help you establish more facts about your niche, but reading and understanding that data can be tricky. If this is not your skillset then hire somebody who love data! It will pay off. Create a customer strategy in line with you brand strategy. Acting, saying and doing according to your customer’s needs will also bring rewards. You need to be congruent in your own work and commentary online to match the service or product you are providing your customers. Be visible. Nobody wants to hear from you if they haven’t heard of you. You need a deep digital footprint, a dynamic social presence and a strong position in your niche to succeed. Work as hard on your own marketing as much as your customer marketing. If you want to discuss building an online brand in a niche area, then get in touch! Simply email me to joanne@digitaltraining.ie. The social media tool that saved my working week this week is Sales Navigator from LinkedIn. It’s helping me find, understand and engage with marketing and communications professionals across the globe. It is a paid premium feature from LinkedIn but is valuable for me to build my online business as I want to connect with the right people. Advanced Lead and Company Search: Find the right people and companies with a search experience that delivers the most relevant prospects. Lead Recommendations: Quickly discover the right people at your target accounts with suggestions customized for you. 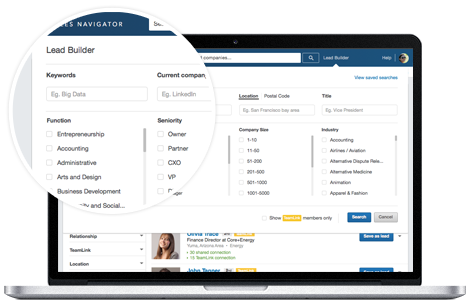 CRM Integration: Automatically save the leads and accounts you are selling to and log Sales Navigator activity to CRM in a single click. Real-time Sales Updates: Get relevant insights on your accounts and leads, including job changes. Notes and Tags: Organize your leads and accounts with tags, and take notes that can be synced back to CRM. Who’s Viewed Your Profile: View the expanded list of who’s viewed your profile in the last 90 days.